What is Needed for a Simulation? – Forge Technology, Inc.
What is Needed for a Simulation? Once the die geometry is imported, setting up a simulation with QForm generally only takes a minute or two. The information is entered through the wizard that will walk you through the setup. Geometry data: The most critical information we need is a model of the dies. QForm can work with any number of dies working at any angle with any kinematics. The die models are imported into QForm from solid body step files or surface iges files for 3D simulations or dxf or iges files for 2D simulations. Forming equipment: Includes mechanical, hydraulic and screw presses, as well as hammers and electric upsetting machines. Multiple ram motions on various axis can be set up as well as spring loaded dies. After you have initially set up your equipment in QForm’s database, you just select it by name for a simulation. The equipment in QForm works like it does on your shop floor. For instance, energy related machines like screw presses and hammers have adjustable blow energy and stroke. Ring rolling simulations use the same parameters as your ring rolling machines such as SMS Meer, Muraro, Siempelkamp and Mitsubishi. The kinematics of specialized rolling machines can be established with multiple rotating tools with complex motions throughout the forming stroke. Material data: QForm users have access to our extensive material database that includes verified flow stress data for several hundred steel grades as well as many non-ferrous alloys, nickel-based alloys, titanium and aluminum alloys. If the workpiece material is something really exotic or the flow stress data is proprietary, you may input your own flow stress data in table form (imported from Excel) or if you don’t have any flow stress data it can be approximated from a modified expression of the Hensel and Spitel formula. Process parameters: QForm simulates the entire forming process accurately. 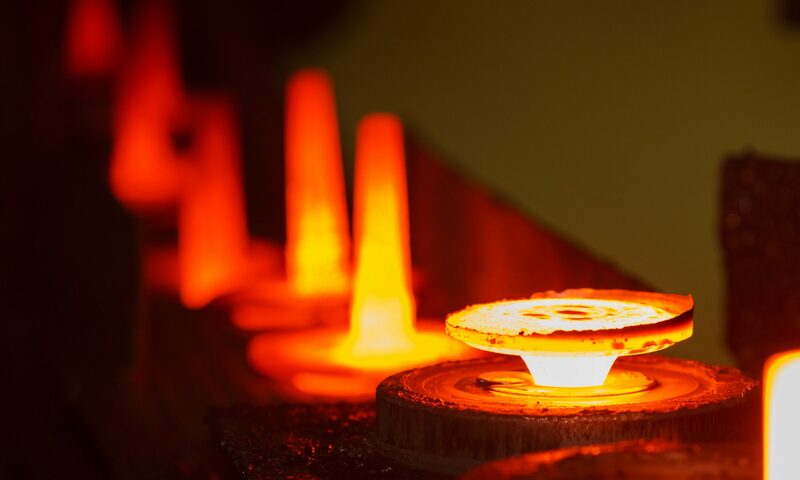 To insure the highest accuracy, QForm calculates heating of the billet and heat loss in the billet while it is being transferred to the die and between impressions as well as heat loss to the die. You enter these times and temperature through the wizard when you set up a simulation. Lubrication data: Lubrication can be applied evenly across the die surface or you can have different lubrication values on various areas of the die. This allows you to accurately simulate situations where the lubrication may not be applied evenly.